Me watching my Mum sprucing up furniture! 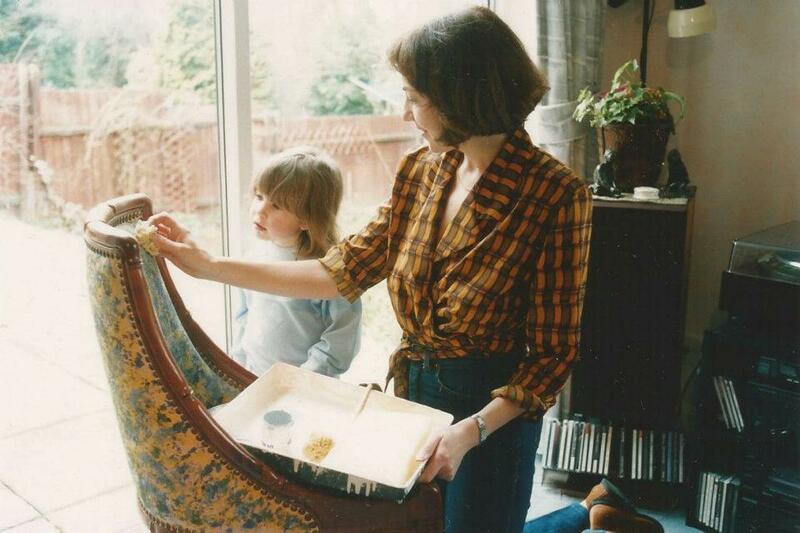 I have been in love with Textiles from a young age, my mum was very creative and trained to be an interior designer. I inherited a lot of my artistic flare from her and my Grandma who is a painter. I studied textiles from an early age but I didn't start painting until my A-Levels, after taking evening classes in Life drawing I really fell in love with capturing the human form. Upon finishing my A-Levels I decided to study an Art Foundation Diploma. I felt this year was essential for completely immersing myself within all artistic mediums and also learning new skills that I hadn't had access to, in particular a module in Photoshop and a short course Diploma in Photography which I loved. Having the chance to experience so many different areas with Art and Design was such an invaluable experience. I decided to study Textiles for my degree and went to the University of Southampton's campus Winchester School of Art to study Textiles, Fashion and Fibre. I graduated from the University of Southampton with a 2:1 in Textile Art. I am now based in the midlands and my portfolio focuses on the figurative form. I create mixed media paintings using a bold acrylic painting style work is bold. My latest collection of paintings include stitched elements portraying tattooed subjects I have embroidered their tattoos into the canvas. I also create embroidered art pieces stitched fashion illustrations, I embroider card creating a textural interesting pieces that are unusual and unique. The simplicity of the stitched line really lends itself to the human form. For chances to see my work please click here for upcoming chances to see my artwork! If you like my work but can't see something exactly what you want please contact me, I'm always open to new ideas.